Visual Studio Code>Other>HexInspectorNew to Visual Studio Code? Get it now. 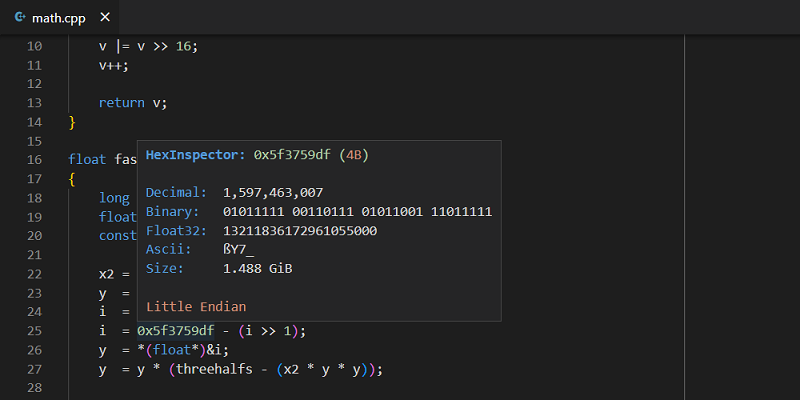 HexInspector is an extension for Visual Studio Code that provides fast and easy way to peek other forms of a hexadecimal values. You just need to point a value and other forms will be summarized in a hover. Hexadecimal values are recognized if they start with 0x or # (e.g. 0x123, #1234). The extension supports both Little-Endian and Big-Endian byte order. You can choose endianness in settings. Extension is available on the Marketplace.